Back in 2008, the Brazil based company Braskem announced the production of the first polypropylene made 100% from renewable resources, which was verified in accordance with ASTM D6866. Now the company is going to build a commercial propylene plant using sugar cane as feedstock. Operational start up is planed for 2013. The green propylene production plant requires investments of around US$100 million. Production capacity is expected to be 30.000 tons a year, at least. 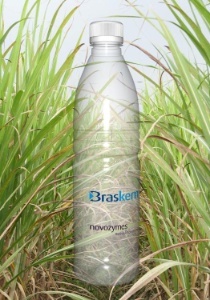 This plant is considered as part of Braskem’s strategy to develop biopolymers and strives to expand the company’s portfolio and production capacity. The use of bioplastics is about to be enlarged by an increasing number of clients and applications. Propylene derived from sugar cane will have exactly the same characteristics and processability as established polypropylene from fossil feedstock. Though, bio – propylene is made from plant based raw material, this polymer is not biodegradable. The environmental benefit relies upon the employment of renewable resources. Besides polyethylene, polypropylene is the most widely used polymer in industry and features some unique characteristics such as the possibility of high transparency and high resistance to impacts at low temperatures, high performance in production processes, the constancy of properties over the long term, low density and high versatility in terms of applications. Do Algae biofuels need 10 more years of R&D to compete?